Islands of Lakshadweep have emerged as a premier tourist destination among vacationers from rest of India and beyond. 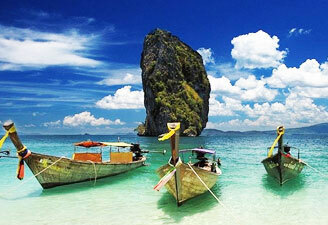 This group of 35 islands is known for its exotic and sun-kissed beaches and lush green landscape. These beaches offer multiple diving and snorkeling facilities. Geologists say that these islands have been formed due to coral activity. give Each of these islands and the sea around them has its unique colour and beauty due to these coral reefs. This smallest union territory - Lakshadweep - has fortunately remained aloof from the mindless modernization. Lakshadweep is just 220 to 440 km away from Malabar Coast of Kerala. It's located in 8º and 12º North latitude and 71º and 74º East longitude. Lakshadweep experiences a tropical climate. It rains here medium to heavy during the monsoon or from May to mid-September. You would never experience extreme climate here except rains and tropical storms in late summer that often results in heavy damage. The mercury fluctuates here between 27ºC and 32ºC. 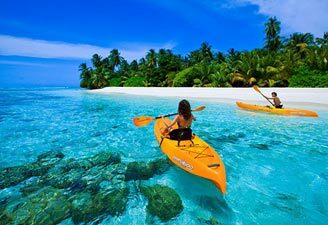 Mother nature beckons all at Lakshadweep islands. Mind blowing marine life leaves indelible prints on your memory. It offers everything from relaxation to rejuvenation besides being far away from madding crowds. Only island open to foreign tourists, Bangaram Island has been developed as a tourist center besides certain other specified islands where the tourists are permitted for day visits. Located just an hour and a half away from Agatti, the island of Bangaram charms you all with its coconut canopies, colorful boats and fish in multiple sizes and hues. You may indulge in any of the amazing activities ranging from the glass bottom boat and speed boat to wind surfing and kayaking. Catamaran sailing, snorkeling, deep-sea fishing, scuba diving and rafting are other water activities you may enjoy here. Never forget to oblige your taste buds with Lakshadweep tuna, squid and other yummy seafood delicacies. You may also spot manyan, octopus, Asian dolphins, leopard Moray eels, frog fish and turtles. Encircled by swaying Palm trees, western beach of Agatti is often described as a 'Heaven on Earth' or 'One of the Nature's Treasures' at Lakshadweep Islands. The combination of the sun, sand and the sea can sooth everybody. Agatti is recognized as one of those islands in Lakshadweep that are equipped with an airport. Entire air transportation operates through Agatti between Lakshadweep islands and Indian mainland. So, Agatti can also be addressed as the 'Gateway to Lakshadweep Islands'. Tourists are also advised not to miss the experience of country canoes cruises and fiberglass boats. Snorkeling, kayaking and canoeing are among variety of water sports offered at Agatti. Dancing leaves of coconut canopies are the major highlight of Kavaratti, the administrative capital of Lakshadweep islands. Never miss to visit Urja mosque at Kavaratti. It is rated one of the most beautiful mosques amongst 52 mosques in Kavaratti. Its ornate ceiling has been carved out from a single piece of driftwood. Another attraction here includes an Aquarium that captivates all the visitors with a variety of colorful fish and corals. Lakshadweep Museum has preserved myriad artifacts.